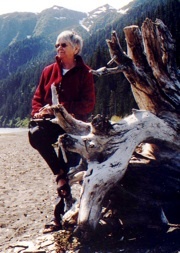 Lynn Martin’s poetry has appeared in Calllope, River City Review, South Florida Review, The Garden State, Green Mountains Review, Sinister Wisdom, Connecticut Review, Earth’s Daughters, Sweet Annie Press, The Centennial Review, and Friends Journal. She also has work in the anthologies, Heartbeat of New England, My Lover Is A woman, and the soon to be published Tail Feather, and an anthology, Bridging New York. Her non-fiction has been published in the Mystery Review, The Brattleboro Reformer, Out in the Mountains, Foster Families and the Southeastern Audubon Society newsletter. She has two self-published books: Visible Signs of Defiance and Talking to the Day. wings unfurled, prepared for flight. do I want to live high among rugged cliffs. tiny birds, their multiple wings fluttering. away from explosions powdering the earth. Surely the sky is empty enough to roam. great wilderness where we belong. is in the coming, hunting for whatever moves.